﻿Be sure to check out the FAQ section of the web site for answers to your questions﻿. We would like to take a moment to thank you for considering the Emerald Coast Technical College for one of your education pathways. 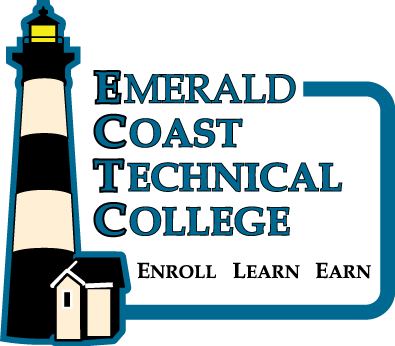 Emerald Coast Technical College is a small but growing school in Walton County. We hope that we will be able to provide you with the best Student Services possible. Please feel free to e-mail the admissions office with any questions as you maneuver through the application process. Note: Students wishing to benefit from PSAV to AAS/AS degree articulation agreements must have achieved a standard high school diploma or equivalent and must meet specified college requirements. *Students must provide documentation of the award of the valid standard high school diploma, GED®, or other recognized equivalent of a high school diploma through official transcripts. Until ECTC receives official transcripts indicating the award of the standard high school diploma, GED®, or other recognized equivalent of a high school diploma, the student is admitted on a provisional/conditional basis pending receipt of these transcripts. No financial aid will be disbursed until official transcripts of the valid high school diploma, GED®, or other recognized equivalent of a high school diploma are received. **Students provisionally admitted may enroll in the first course of their PSAV program; however, no federal financial aid will be disbursed to the student until all requirements for admission to ECTC and qualification to receive financial aid are met. Tuition waivers, exemptions, and/or deferrals are not available to students who are admitted under this provision until the student meets the regular admission requirements. Special diplomas and certificates of attendance may be accepted for admission into certain PSAV programs. The special diploma does not meet requirements of the standard high school diploma. In general, students must have achieved a standard high school diploma/GED®, or be beyond the age of compulsory attendance and meet the criteria for homeschooled students in order to access federal financial aid. Students who do not meet criteria for admissions to postsecondary programs or financial aid may wish to enroll in ECTC adult education/developmental programs to earn a GED®. Students are reminded that some PSAV programs at ECTC require the standard high school diploma or GED®/other recognized equivalent of the high school diploma. Students enrolling in the practical nursing program MUST have achieved a standard high school diploma or GED® and must be 18 years old at the time of the first scheduled clinical rotation. Official transcript of award of a standard high school diploma from an accredited Florida high school, reflecting enrollment into ninth grade in an accredited Florida high school 2003-2004 school year or later. Official documentation verifying achievement of FLDOE approved and specified industry certifications/ licensure. See a representative in student services for additional information. Complete general application. There is no cost for submitting the general school application. This application informs Admissions that you are interested in attending ECTC. Meet with counselor/advisor for career counseling if needed. Limited access programs such as practical nursing and cosmetology require a student interview with career program staff prior to admission to the program. Waiting lists are maintained for some limited access programs and students may register and enroll only after receiving the appropriate program acceptance letter. Students are encouraged to meet with program instructors prior to first class attendance. Counselors can advise students regarding “best match” with career education programs and individual student interest and aptitude profile and personal goals. Counselors and teachers can assist students in evaluating job placement possibilities.